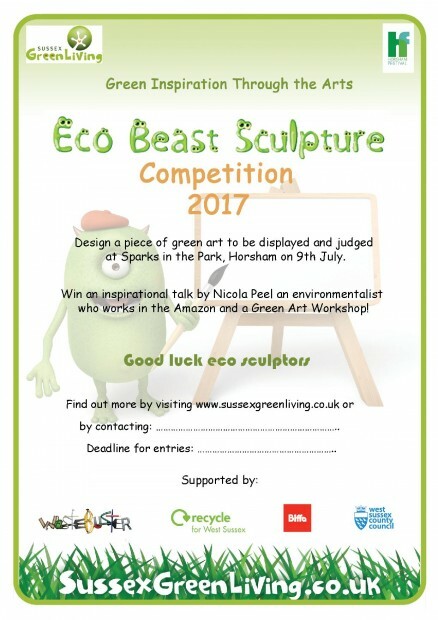 Sussex Green Living in partnership with Horsham Festival and West Sussex County Council Waste Prevention team, are delighted to launch an Eco Beast Sculpture competition, open to children and young people in West Sussex. This exciting competition aims to inspire young sculptors to use waste resources (some people call it ‘rubbish’) to create a piece of green art, with the slogan, ‘THINK BEFORE YOU THROW’. We want to instill the mentality that ‘there is no such thing as rubbish: just a waste resource in the wrong place’ and raise awareness of the importance of recycling. What materials can I use and how big should my sculpture be? You may decide to use the materials which can be recycled in your own home recycling bin. Or maybe use materials which cannot be recycled in our household bin but can be recycled at the Household Waste Recycling Site. Alternatively, how about using unwanted garden shed items or WEEE (Waste Electrical and Electronic Equipment). The theme of the sculptures is ‘Eco Beasts’. The sculpture should not be any bigger than 100 x 60 x 60 cm. The competition is open to all nurseries, primary schools and young person’s uniformed organisations throughout West Sussex. Each organisation entering a sculpture will be awarded a ‘Certificate of Participation’. There will be four age groups: under 5s, 5-7 years, 8-11 years and 11-14 years. The winners will receive age appropriate prizes. Each nursery, school or group can submit one entry in one or more age category. 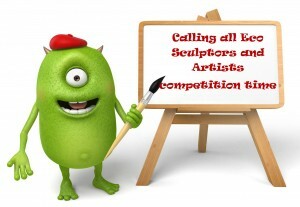 All entrants will be asked to attach a small label to their sculpture. On the front:- the name of their eco beast, a sentence explaining why they used the waste resources they chose and which age group they are in. On the reverse of the label:- the name of the nursery, school or group and a contact name, email and telephone number). What are the deadlines for the competition? Entrants need to notify organiser Carrie Cort by email, cort@sussexgreenliving.co.uk as to how many entries they are submitting. This must by done 4pm on Friday 30th June. 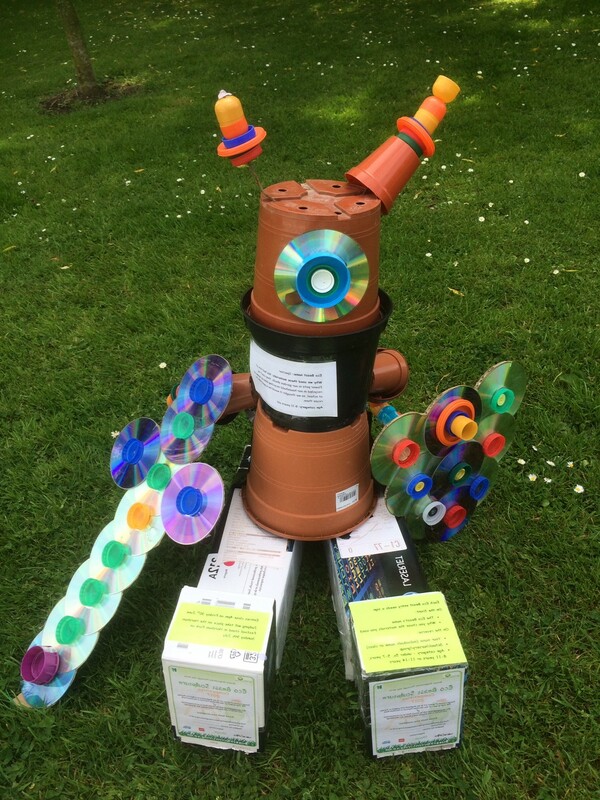 Someone from each nursery, school or group must be responsible for delivering their entries to the Horsham Festival stand at the family event in Horsham Park on Sunday 9th July. The sculptures will be undercover in a marquee. Judging will take place at Funday Sunday (replacement event for Sparks in the Park) a fun family event in Horsham Park on Sunday 9th July 2017. The judges’ decision is final. There will be a prize for the winning entry in each age category. Nicola Peel, a multi award winning environmentalist and solutionologist, will deliver an age appropriate talk, followed by a Green Art Workshop, for the winning entry at their nursery, school or group location. The workshop will be delivered by Nicola, Carrie and a team of West Sussex County Council trained Waste Prevention Advisors. Where possible we will link the Green Art session to the winners’ current topic or theme. A printable copy of the poster and briefing document can be found here. 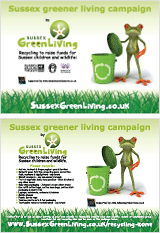 This entry was posted in Children & nature, Eco School Sussex blogs, Events, Green art & games, Green stats, facts & news. Bookmark the permalink.